This Summer we turn our heads north to the tropical part of Australia called Queensland. Once a month, we’ll be setting up shop in one of Brisbane’s finest stables – Capulet. We’re staying true to our roots, providing quality house music from 1 till 9 on the open-air terrace in the heart of Brisbane! We’d like to make sure you guys are writing this one down in your agendas, because even though it’s still some weeks away, this is definitely a Sunday you want to be prepared for. The kid wonder from France is here to give Brisbane some love and take over the Capulet courtyard. With a couple of mind blowing performances over the last years at S.A.S.H in Sydney, we wouldn’t dare to keep him from you dancers in Australia’s sunshine state. Equally legendary, we got Pepperpot on sunset duties. The Frenchman is known for his energetic, groovy sounds which always takes the crowd to another level. Two Brisbane locals will be selecting some fine opening and warm up tunes. 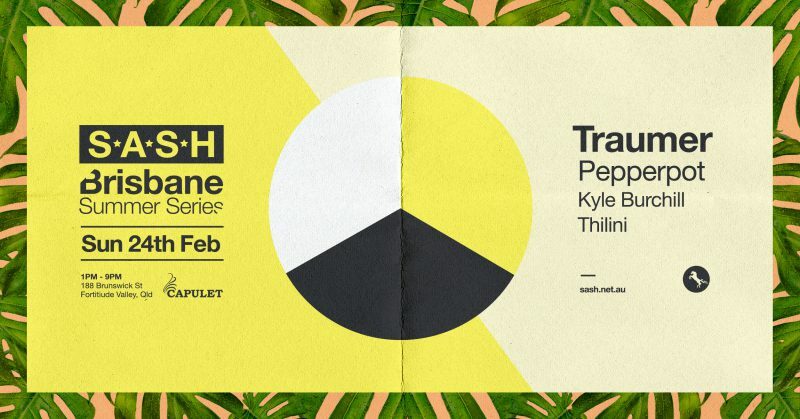 Thilini and Kyle Burchill have got us more than excited to hear them heat it up. Straight from the Paris underground scene Traumer has proven multiple times that his abilities as a deejay and producer are extremely impressive. In a subtle way he manages to incorporate worldly rhythms and sounds in his productions, mixing them neatly with the house and techno tradition, without losing track. Although he’s relatively young, he already established a respected name for himself worldwide. Expect killer basslines complimented by some ethnic accents!